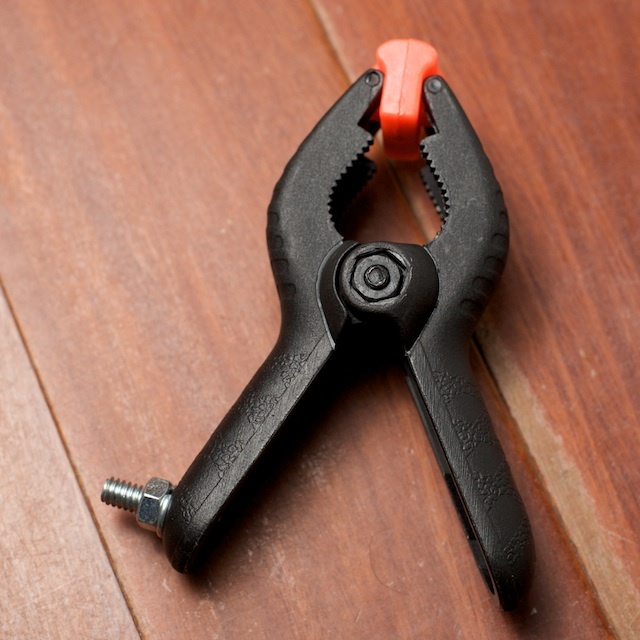 Home-Made Super Clamp: Bogen makes a very useful thing called a Super Clamp. 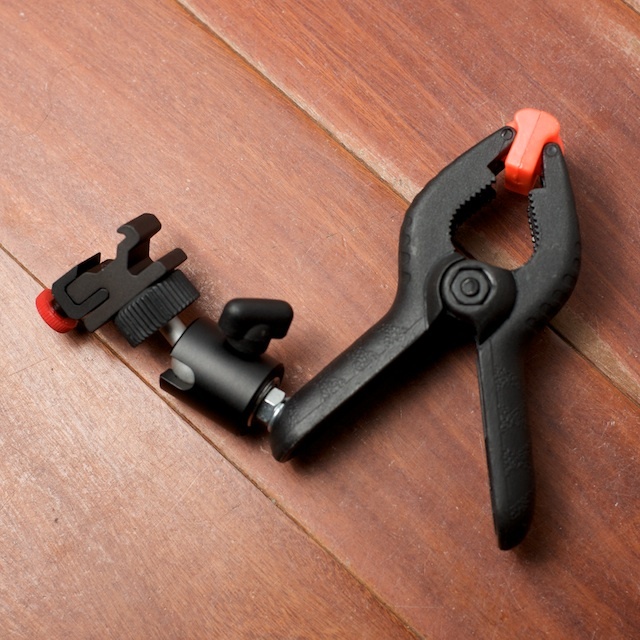 What it is, is a very versatile, very sturdy clamp that is used to attach photography gear to just about anything. If you do any kind of location photography or POV photography, this thing is a must. It’s not really that expensive, for me the problem with it is that it is heavy and a bit bulky.Enter the DIY Super Clamp: I made this clamp out of an ordinary plastic clamp that I found at one of those super-dooper home stores. You know the ones, like a friggin’ warehouse for houses. In the same super-dooper store, I found a box of 1/4 20 nuts and bolts and some lock washers. 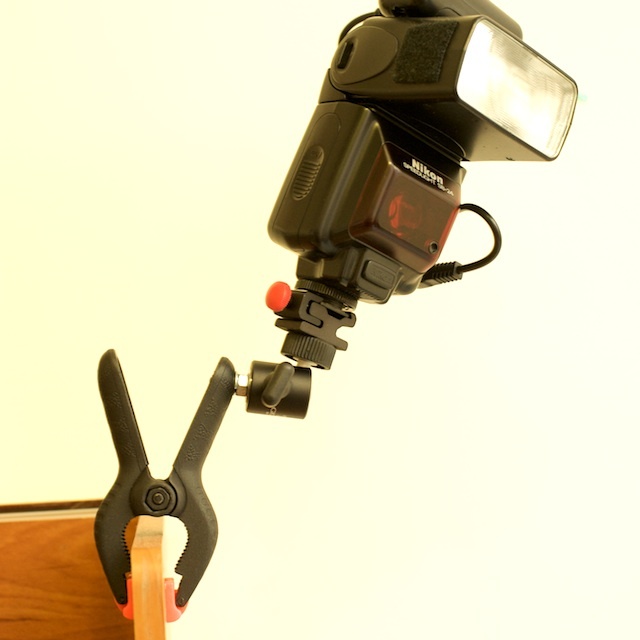 I simply stuck the bolts through the holes in the handle of the clamp and attached an inexpensive mini ball-head from Giottos and a flash mounting thingy from Stroboframe. 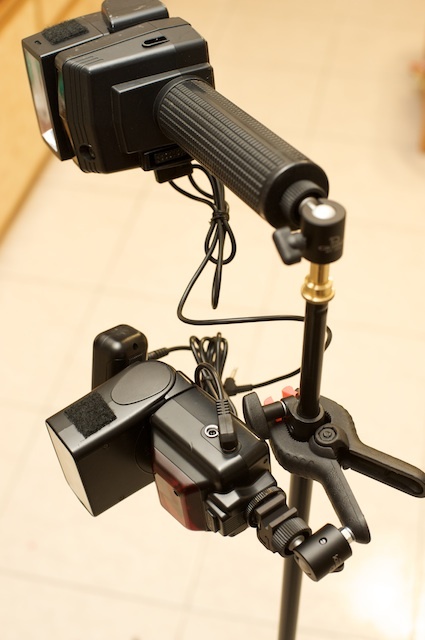 Voila… now I can attach my flashes to nearly any pole, desk, or sticky-out thing. I even use these to attach a second flash to my light stands when I need more power from my flash. They’re not perfect, but they’re pretty damn close. Snoots are probably the easiest to make and understand. 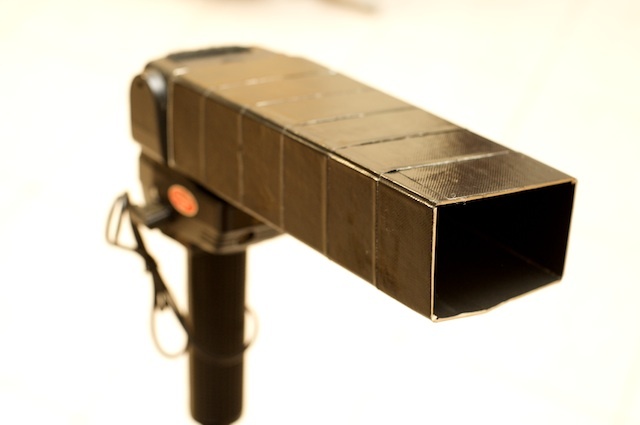 A snoot is simply a piece of cardboard that wraps around the head of your flash to keep the beam of light more narrow. I’m not going to write a long “How to do list” on how to make one of these. Just go here and read all about it. My basic point of writing this basic point is that you should make one or two and start playing with them on your flash. They’re fun. Grids do a lot of the same stuff that a snoot will, but they take up a little more room in your camera bag and are a bit harder to make. But they also throw a nicer beam of light and are worth the extra effort. There are a few different kinds that you can make. The best two that I’ve seen are the plastic corrugated cardboard ones, and the black straw ones. I prefer the black straw ones, but you decide what’s best for you. Again, I’m not going to write up a big “How to do list” on how to make these. 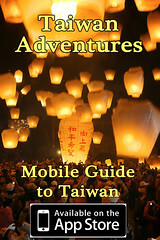 Check this out for a good step-by-step. One piece of advice is to stick them together using a hot glue gun. That worked better than normal glue for me. If you’re interested in this stuff and have questions that I didn’t answer above, please feel free to ask! I love to help! DIY super clamp with 1/4-20 bolt attached to the handle. 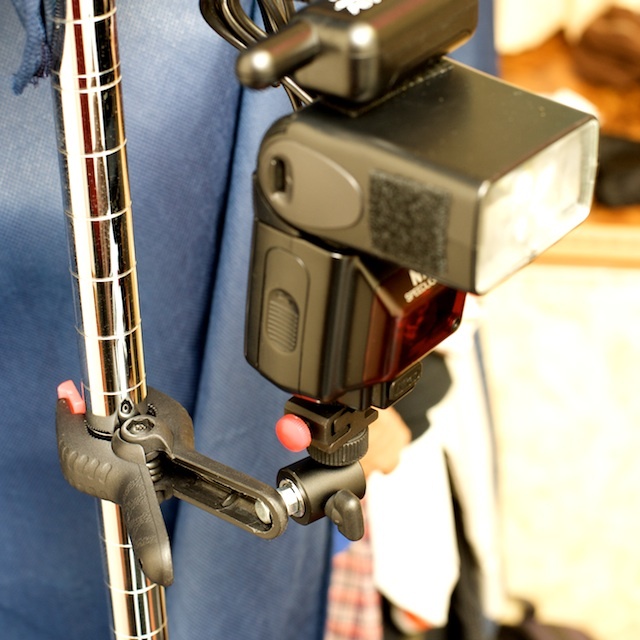 DIY Super Clamp with Mini Ball Head and Flash Attachment. 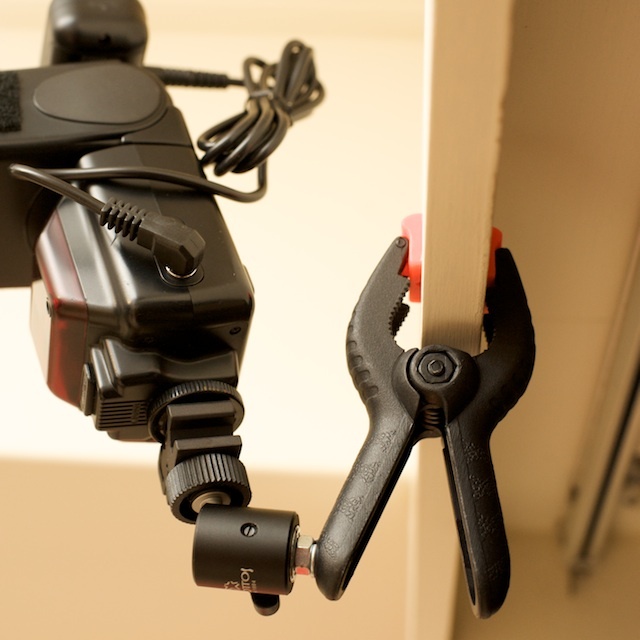 DIY super clamp with a flash attached to a book shelf. DIY super clamp with a flash attached to a round pole. 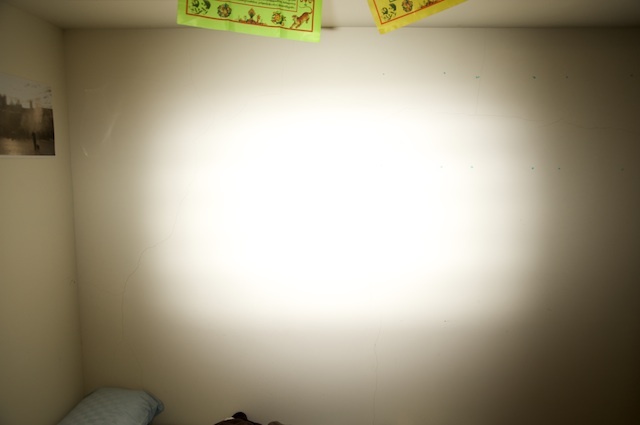 DIY super clamp with a flash attached to a ceiling fixture. 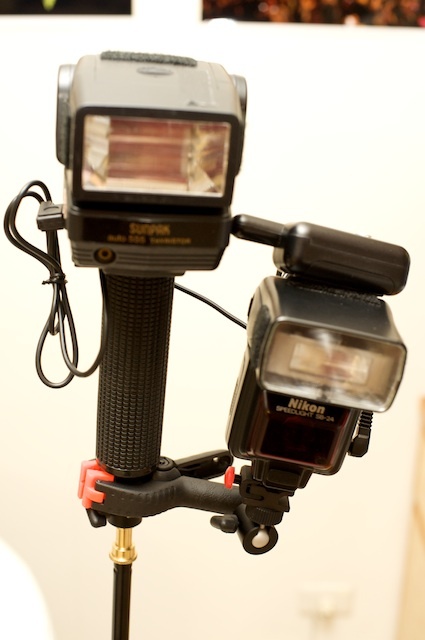 DIY super clamp with a flash attached to a lightstand holding another flash. 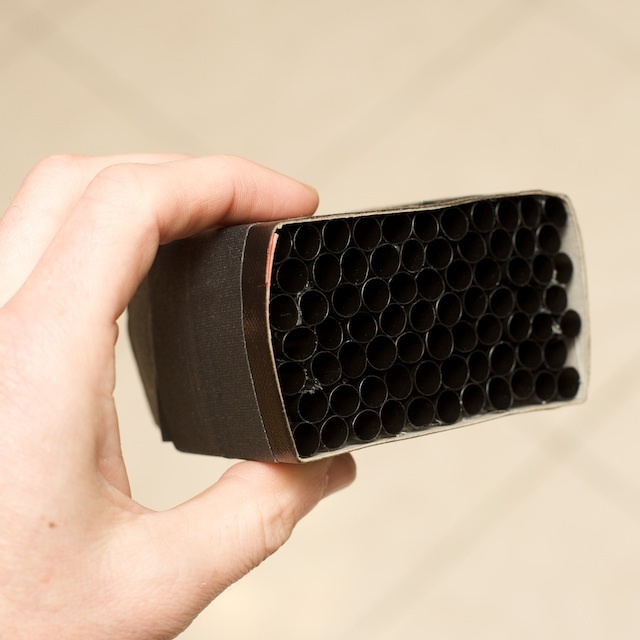 A grid spot made from black straws, cardboard, glue and black tape. 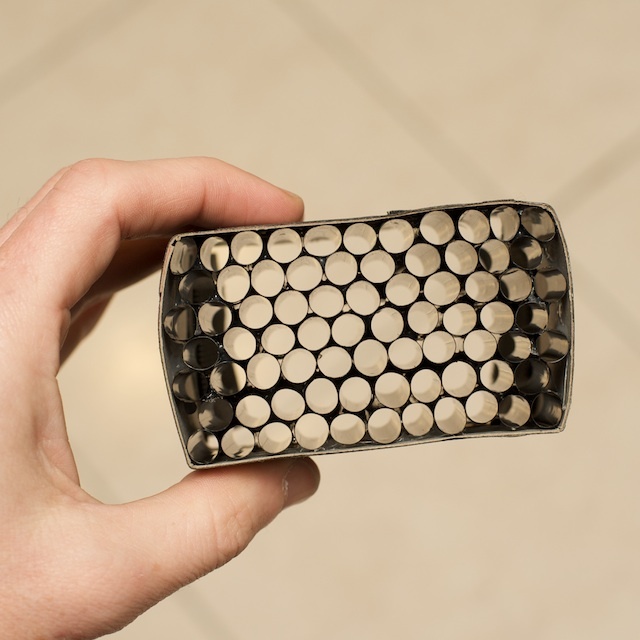 Here’s a look through a DIY grid spot made from corregated cardboard. 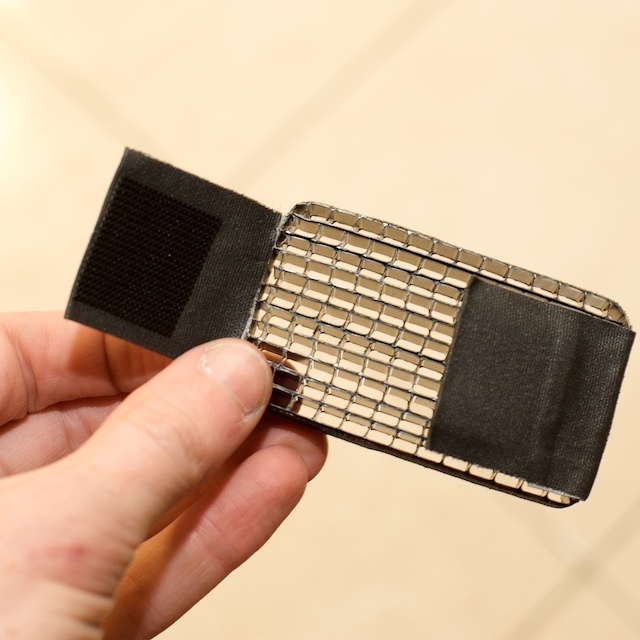 Note the attachment flaps made from gaffer’s tape and Velcro. 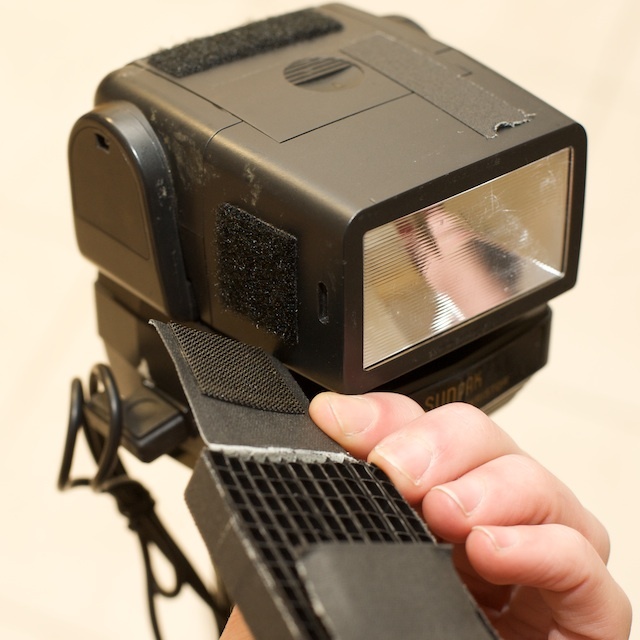 Always put the fuzzy side of the Velcro on the flash head and the hook side on your attachment. 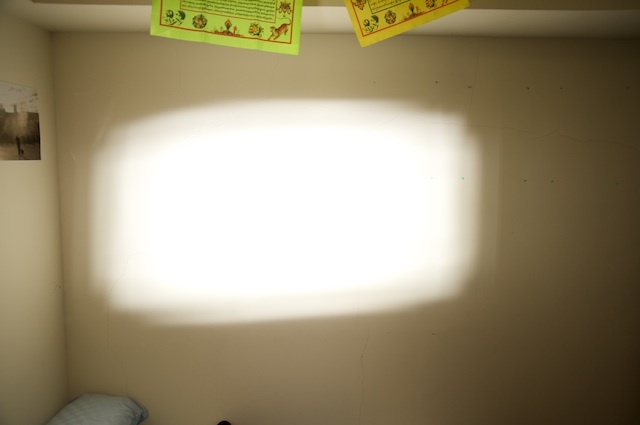 A DIY grid spot made from plastic corregated cardboard, attached to a flash with Velcro. 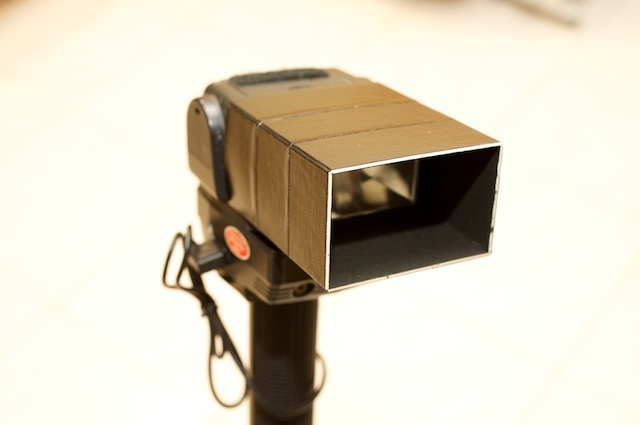 This DIY cardboard snoot is actually made out of matte board, a stronger, stiffer alternative. Here’s the pattern that a DIY grid spot made from straws will cast on to the subject. Note that the light fall-off on the edges is more pleasing than that of a cardboard snoot. 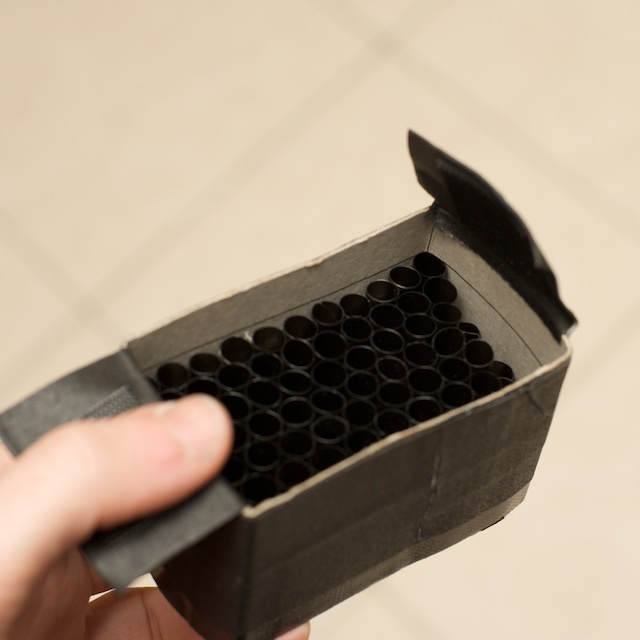 Note that the light fall-off on the edges is not quite as pleasing as the black straw grid, but nicer than the snoot. 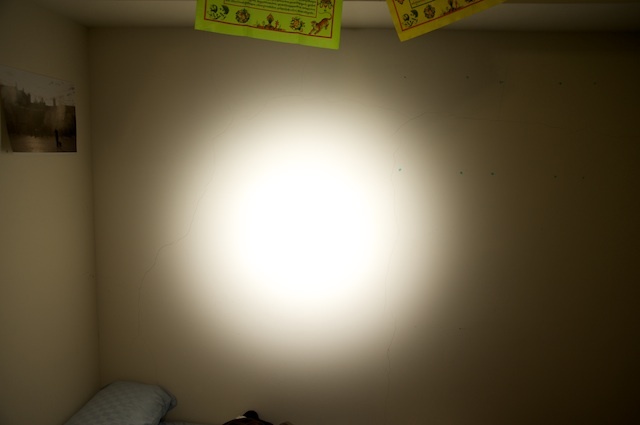 Here’s the pattern that a DIY cardboard snoot will cast on to the subject. Note that the light fall-off on the edges is not that nice… but acceptable (for me). Also note the nice, even light across the center. 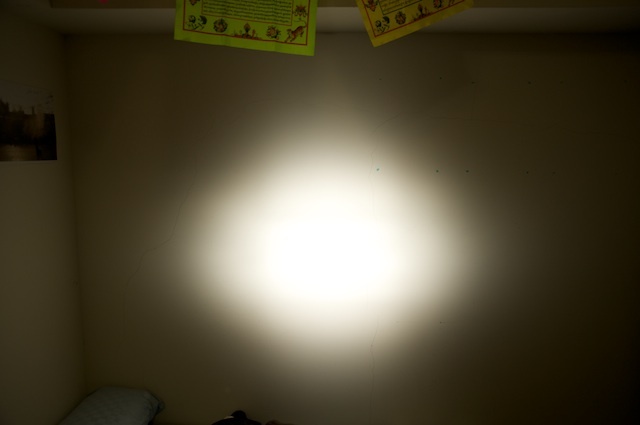 Also have a look at my DIY Soft Box for Strobes. Some cool stuff there. I actually made a corrugated plastic cardboard grid spot a couple of weeks ago but it’s not as neat as yours and attaches slightly differently. What type of flash triggers are you using? 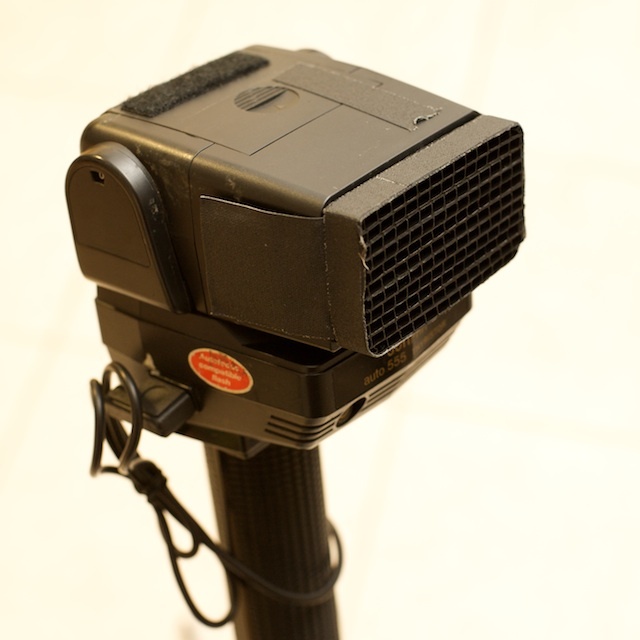 It looks too small for a Pocket Wizard, it’s not Elinchrom (what I use) and doesn’t look like an eBay trigger. I don’t like the corrugated cardboard as much as the black straws, the light just doesn’t seem as consistent. I recently got a set of Paul C Buff’s CyberSyncs, and I have to say that they’re really nice. I’ve been using Radio Slaves for a long, long time and the CyberSyncs are much smaller and more reliable. I haven’t managed to find black straws in Taiwan, although I don’t often go to bars so that might have something to do with it. Try Burger King. They’re free for as long as you can stand there and push that little lever down! Thanks for the tip about Burger King – another place I almost never go to, but I guess I can pop in and have some fries one lunchtime. Just a heads up. I had my sb600 attached to the same clamp in the exact same fashion and one day the flash fell due to the area around the hole drilled in the clamp fractured and away she went. I switched to a metal clamp and it seem much stronger. Thanks for the warning. I’ll keep an eye on mine. Maybe a bigger washer on the back would help.